Bean, Jonathan. Building Our House. New York: Farrar Straus Giroux, 2013. Print. 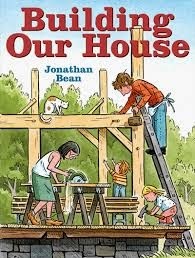 Using a slightly old-fashioned, pastel colored illustration technique, Bean takes the reader through most of the steps of building a frame house. (He does condense the time frame.) The whole family helps. About three quarters of the way through, it becomes apparent that it is the oldest, female child telling the story. The first person narrative makes it very personal for the reader. Their determination to get this done and done well creates the throughline of the story, ending with the family cozily sitting by the warm wood stove. Although not mentioned in the story, the mother is shown pregnant throughout the building process. Thus the end of the book not only shows the beginning of the family’s life in this new home, but also a baby - the beginning of a new life. The author/illustrator has presented much for the adult reader and child to discuss.